PAINTING the Forth Bridge used to be referred to as a job that never ended. 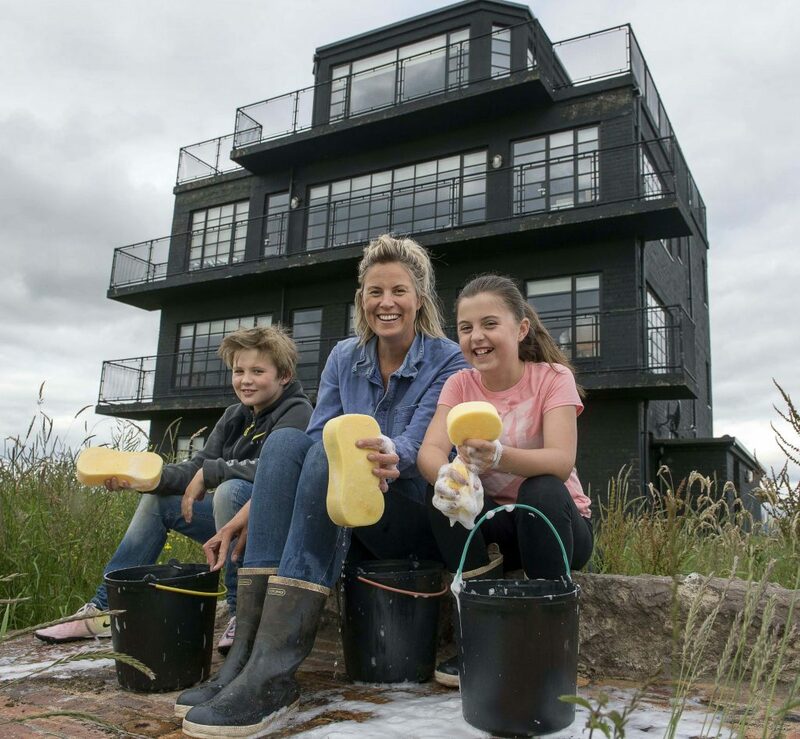 And Charlotte Seddon and Justin Hooper know just how that feels, as they live in a house which has 76 windows, meaning cleaning their panes can be, well, a pain! But it’s worth it, as the pair live in a remote former air traffic control tower which they’ve modernised to create one of Scotland’s most remarkable homes. Charlotte estimates that to get all of her windows sparkling at the same time would take her at least 36 hours – but, unsurprisingly, admits she’s not managed it yet. But all that glass is worth it – for it’s a home filled with light and incredible views of the sea and Highland mountains. Charlotte, 43, a florist, said: “That’s the immediate thing that you notice – how much of it is window. “That’s part of the appeal. The romance and the reality are different things – the romance being how beautiful it is and the reality being the cleaning of them. The couple are nearing the end of a five-year renovation which has transformed the derelict former Royal Naval Air Station HMS Owl from ruined to remarkable. During that time they have installed 30 cast-iron radiators, and an enormous seven-foot bath which needed 10 people to carry it up the stairs. A huge chunk of their £250,000 budget for buying and renovating the property was taken up by the £110,000 cost of 76 new windows, which range from a tiny four by nine inches to 15 feet by eight feet. Charlotte and Justin, 50, who’s in advertising, bought the C-listed structure near Tain in Ross-shire in 2012. It had fallen into decay after the war, when torpedo bombers flew from the naval air station. The couple, with children Agnes, nine, and Albert, seven, only moved into the property in April, but have already worked out the best way to tackle them. Charlotte said: “You do the ones that need doing and . . . then you think, forget it, otherwise you’d spend your life going mad. “You do the essential ones. I think there’s about 10 that I’ve never touched. “Because it was such a big project, I think maybe our standards have lowered, because none are particularly gleaming. “I’ve done them all in one go with a hose when they were absolutely filthy and that took about five hours. “Inside and outside, to do all of it properly – washed, dried and polished – would take about 36 hours. I use elbow grease and soapy water. They’re never at the polishing stage, it has to be said. “I just use buckets and buckets of hot water and squeegees. Everyone has their preferred tool of choice. Our doctor’s orders: The Sunday Post’s famous column is collected for a new generation, but does 1950s advice hold up in 2019?